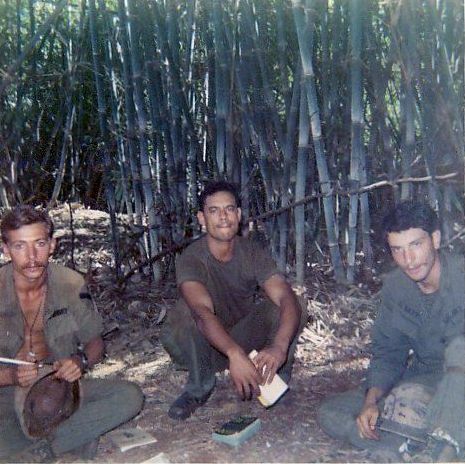 Three years after the Americans abandoned Vietnam, in the depths of the Forest of Screaming Souls, NVA veterans search for the remains of men and women killed in combat. So begins The Sorrow of War, by Bao Ninh. In 1995, when reading my paperback copy, I would fall into a trance, feel as if I were floating above my bed. What was happening, I did not know. Several months later, traveling in Southeast Asia I invented reasons to not locate Bao Ninh. In New York I purchased the book in hardback; at the sight of Ninh’s dusk jacket photo I saw those we hunted, and who hunted us. That night I dreamt my platoon was trapped, out of ammo, trying to escape. On the occasion of Christmas and the New Year, I am very glad to send you our warmest regard from Vietnam. I wish you and your family a new year full of happiness. I hope we will soon meet each other in Hanoi. Summer 1998: I’m sitting in a packed auditorium at the start of a writer’s workshop. Ten meters to my right, five Vietnamese writers wait to be introduced to the audience. Their remarks concluded, single file they walked to the exit at the rear of the room. Instantly I jumped up, pushed past a gauntlet of crossed or outstretched legs. “Excuse me…excuse me…” I said, following my target. “Bao Ninh!” I stammered, as he nears the door. He turned around. The puzzled look on his face asked, “Who has called me? 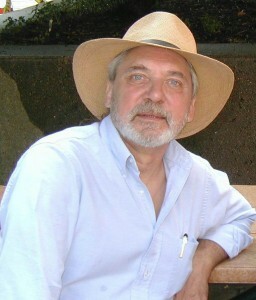 Which of the American’s knows my name?” From five meters we locked eyes. We rushed to each other with open arms. Ninh pulled me close, clapped my back once, twice three times, as if I were a long lost friend. Overcome by deep feelings, I sobbed uncontrollably. Ninh took my hand and me away. “No…I’m all right.” I said, still sobbing. A tall graceful woman drew near. Lady Borton provided medical aid to both sides during the war. A noted translator and writer, she had accompanied the Vietnamese delegation from Hanoi. Through her, Ninh and I spoke excitedly. Then Ninh explained he had to go. We could meet tomorrow at noon. That night, an old recurring dream: the invisible spirit grabs my feet, yanks them straight up. I can’t move, I scream and struggle, then wake, overcome with dread. But this time, fighting back, I defeat the demon. Waking, I’m calm, free. That afternoon, beneath a cluster of shade trees overlooking Boston Harbor, I sat cross-legged opposite Ninh. A muscular wiry man, then in his late forties, perhaps 5′ 6″ tall, he sported a tousled head of jet black hair. A wispy Fu Manchu mustache adorned his upper lip. For three hours, we talked through a second interpreter. My questions were academic: What did Ninh do in the war? Could he talk about NVA tactics? What did his platoon talk about when not in combat? What were his feelings about the Communist party? Ninh was thoughtful; patient in his replies. 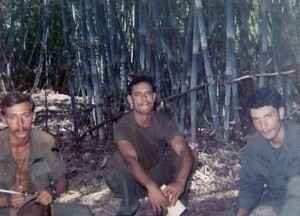 I felt foolish, recalling too late that Ninh had spent six years in the Glorious 27th Youth Brigade. Out of five hundred, ten survived. We stood up, dusted ourselves off, shook hands, and headed back to campus. 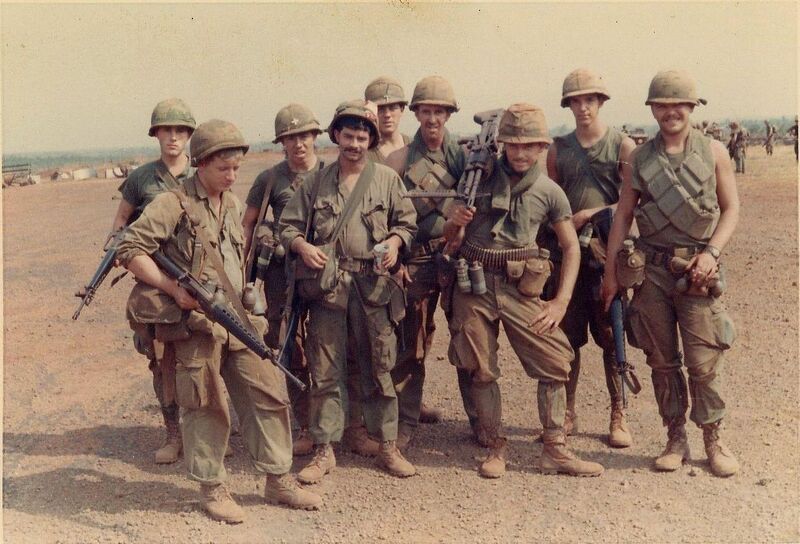 Along the way, as Ninh stopped to smoke a cigarette, I delved into my wallet for the small photo of my platoon I’ve carried for thirty years. Ninh tucked the photo into his shirt pocket. I checked my watch. It was past noon. We headed to the student caféteria. On the last day of the workshop Ninh stood center stage at Harvard’s resplendent Yen Ching library. Somewhat nervously, he bowed to the sizable audience, held his book close to his face, and began to read. The dreamy lilt of his tender voice was calm, lyrical. 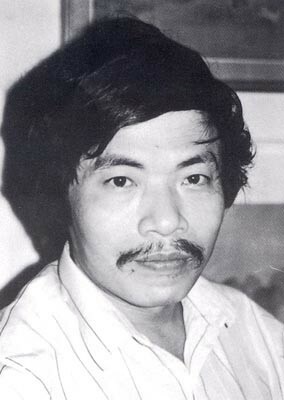 Ten minutes later Ninh closed the book, bowed to modest applause, and stepped from the stage. A handsome, vigorous man, and a heavy combat vet, Larry Heinemann, author of Paco’s Story, winner of the National Book Award, stepped up to read Ninh’s work in English. Clearing his throat, adjusting his shirt collar, Larry’s booming voice filled the hall with the sights and sounds of the horrific battle in the Forest of Screaming Souls. The terror of the bombardment, wiping out an entire NVA unit, astoundingly dramatized, transfixed the audience. When Heinneman smartly snapped the book shut, he motioned to Ninh, who now received thunderous applause. 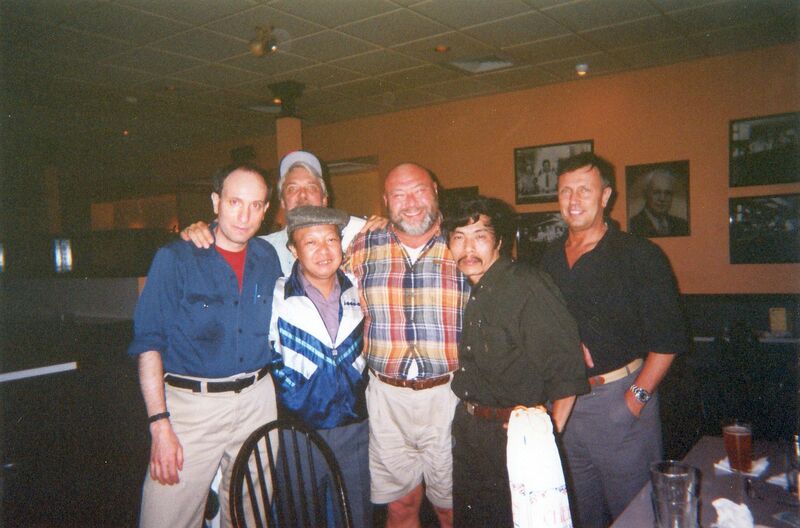 That night, five Vietnam vets and the five Vietnamese vets, former NVA, meet at a well known Boston bar. Among the Americans: Andy, a heavy combat Marine; Larry Heinemann; Allan Farrell, a professor of languages, and Special Forces colonel stationed in Laos; tall lanky Chris, an Army sergeant wounded his first month in country. The Vietnamese, each an established poet or writer, had spent years in combat. After two rounds of beer our grim mood gave way to easy banter. I sat close to Ninh. Throughout the night he sat erect, sipped shots of whiskey, chain smoked American cigarettes, hardly spoke. After a time someone asked him which side had the better automatic rifle. Ninh said the AK47 was the superior weapon. Submerged, rain soaked, caked by dust, or clotted with mud, it never failed to fire. But, he said, the M16s small tumbling bullets caused terrible internal wounds, which caused great suffering, and many losses. 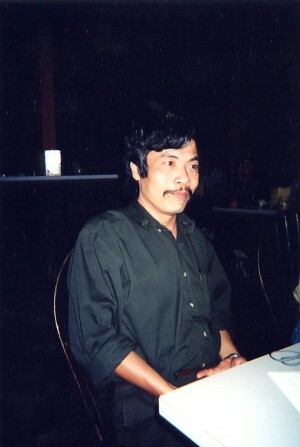 Someone asked, “What was your saddest memory?” Ninh gazed into the curling blue smoke of his cigarette. Through Mr. Mau, he said, “Finding and burying our dead.” At that moment his face went blank and everyone went silent. 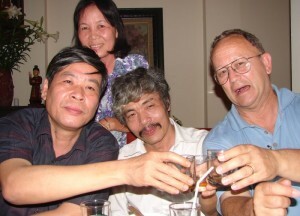 Toward 1AM, as the high-spirited group continued to drink and jabber, I pantomimed to Ninh. He nodded agreement. “Would you?” I asked Chris, offering him my camera. Chris had been shot in the neck. An angry , serpentine scar worked its way from his jaw to his collar bone. “Sure, Doc,” he said. Ninh and I put our arms around each other. I barely managed to hold back my tears. Chris said,“Smile, Doc. C’mon, smile.” I barely managed to keep my jaw clamped shut. Afterward I took a photo of Ninh and Chris, and Chris choked up. Whatever Ninh felt he did not reveal it. “Be right back,” I said, heading to the loo, but once out of sight I walked to a nearby liquor store. “I’ll take that bottle, and that one, and that one,” I said to the clerk. 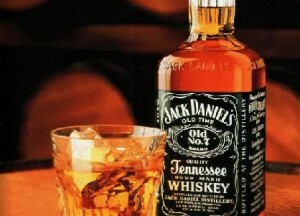 “Can you wrap them, please?” Larry had mentioned that Ninh liked Jack Daniels. His words rang true, but in war, we former soldiers, we American’s and North Vietnamese, would have shot each other on sight and thought nothing of it. Some things are hard to forget. I handed the next to last bottle to Mr. Mau. The elder of the group, he’d fought the French, then the American’s. Everyone clapped and smiled at his eloquent remarks. Then it was Ninh’s turn. He seemed genuinely surprised. “Open,” I said, pointing to the upright package. As he gently tore open the wrapping paper, the familiar stout bottle, the bold black and white label, came into view, and Ninh’s eye brows nearly flew from his head. 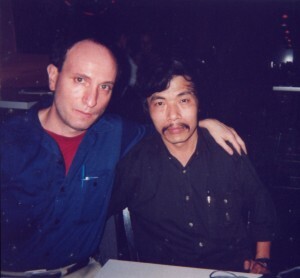 Earlier that day, Larry had told me the Vietnamese government had few resources to treat war trauma. 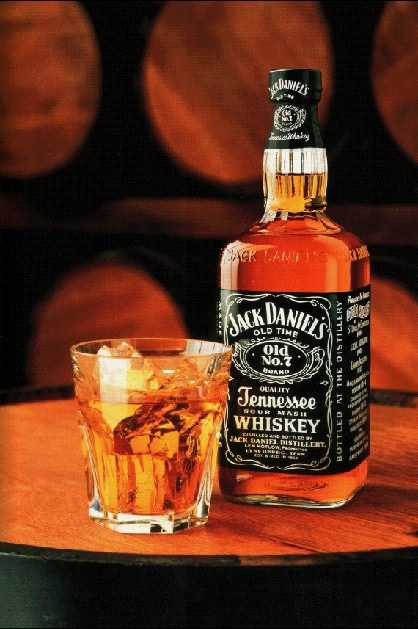 For veterans and civilians, drinking was a common and acceptable way to sooth PTSD. Ninh, said Larry, had acquired a taste for the strong American liquor, which brought sweet relief from war and its sorrows. I think of Ninh often. It’s been twelve years since that extraordinary coincidence, that turning point. To this day I don’t fully understand the meaning of my sobs. Some say it’s grief for my platoon, for the men and women we murdered. I don’t know. But I do know this: in peace time and war time, we are all human beings. All of us. UPDATE: In May 2018 I received an email from Rohit Iniani, a journalist in India. 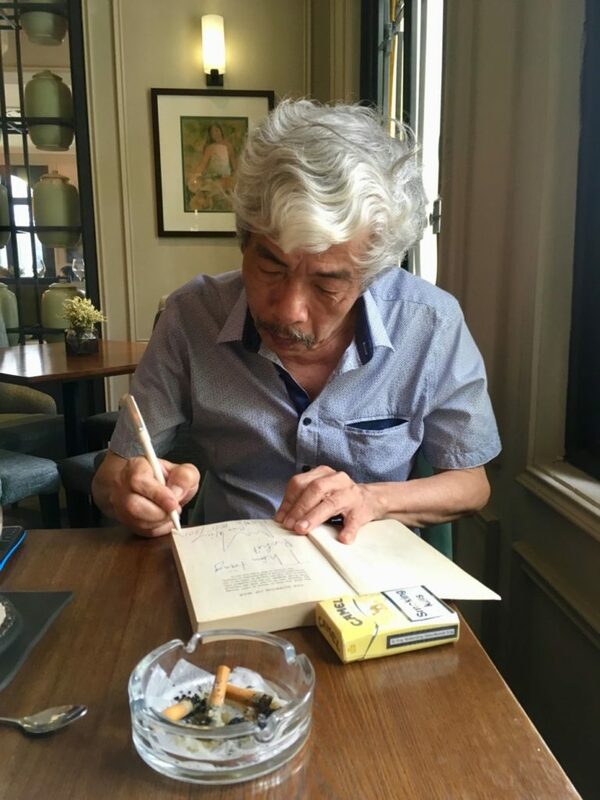 He admired Bao Ninh and wished to interview him. Could I help out? I was skeptical. And protective of Ninh’s privacy. And it turns out, rightly so. Ninh rarely gives interviews. He does not trust the media. For example, told that the Vietnamese side of the story would be balanced, Ninh expressed disappointment in the Burns/Novick PBS series The Vietnam War, in which he agreed to appear.